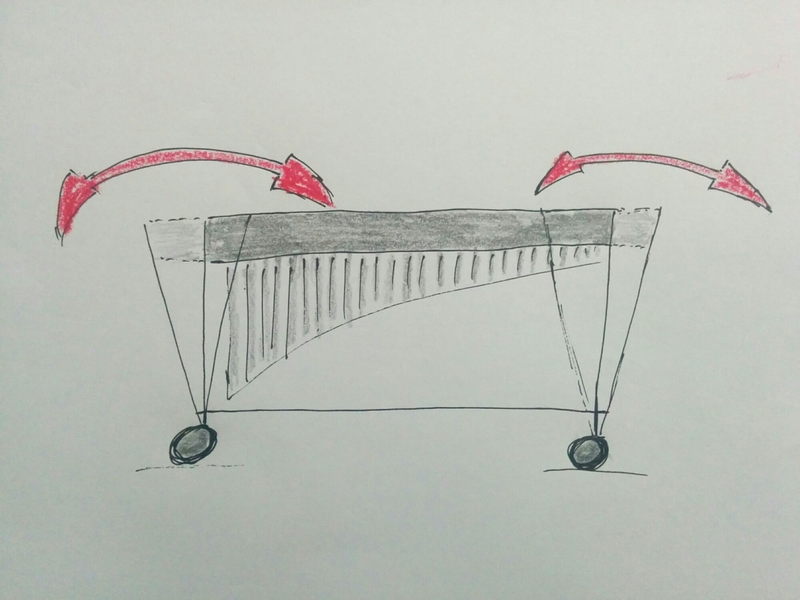 If vibraphones are moved around whilst set up, common sense would dictate that the pedal is raised up off the floor, so that it doesn’t drag along the floor and bend the adjustment rod. Well that’s what this instrument was in for; a demonstration of how rare common sense is. Furthermore Yamaha vibes have a detachable motor and control unit. On instruments that live set up, like this one, this is an annoying feature. The way the motor is attached is fine, that can be tightened in place, but the control unit just hooks over the note rail. So whilst it was in my hands, I was asked to permanently fix it to the instrument. However, as I was moving the instrument it became apparent that something else was wrong. The drawing above shows Paul the Porter pushing an instrument along, about to enter a room. The force is being applied to the top of the instrument, however the wheels running along the floor have resistance in the opposite direction. 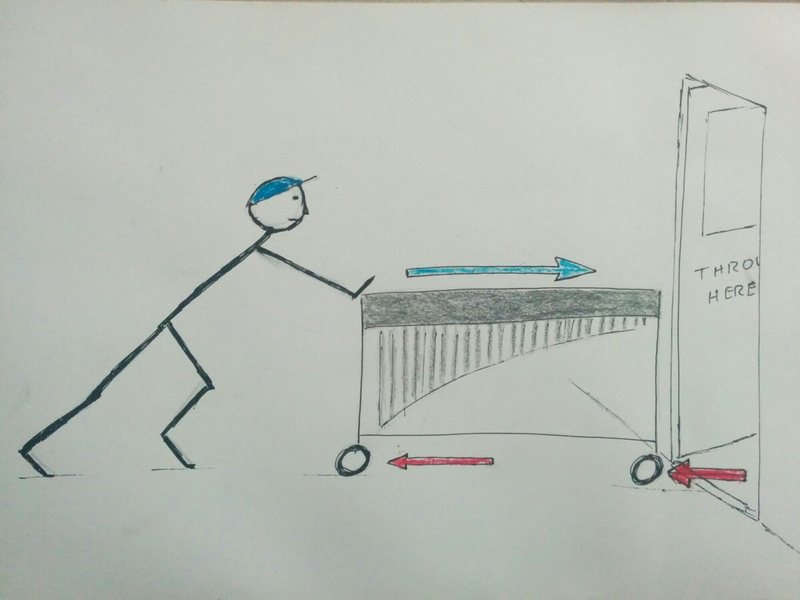 As Paul wheels the instrument through the door and consequently over the door tread, the resistive force increases further in a shock loading. This is why instruments in general, including this vibraphone end up wobbling. As can be seen from the drawing above the movement on the instrument is greater at the top than the bottom. The top frame, which is the note bed, is therefore being pulled apart. The only way to resolve this situation, is to continue the destruction, in a controlled manner, until the weak link is exposed. 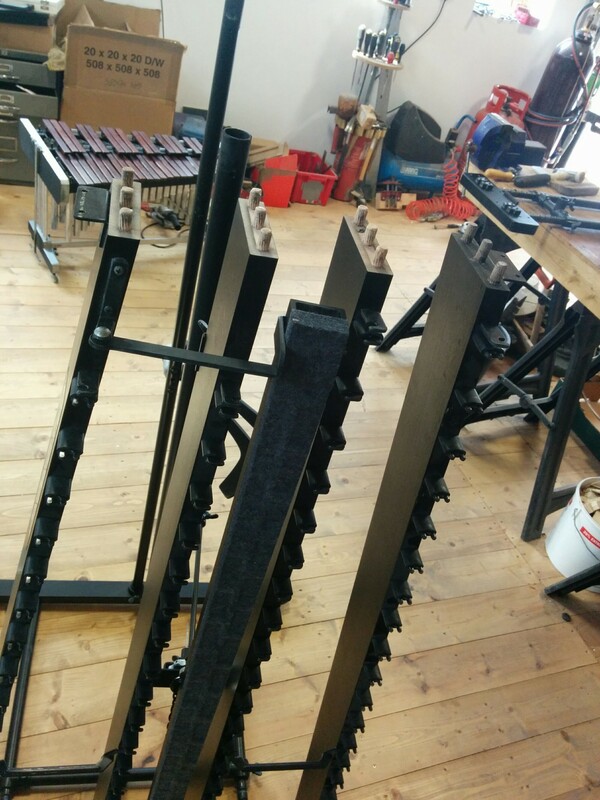 On Yamaha vibraphones, as can be seem above, everything is pegged and glued together. Which is fine, if it is designed and assembled correctly. However if it is not, this self destruction is exactly what happens as the badly designed frame starts wobbling and all the screws work loose. There is not much I can do within the remit of the job. Ultimately, I would have to extensively modify the instrument making complete new sections. However I can’t return an instrument that I can see is falling apart, so everything was glued and clamped back together. Straightening the connecting rod between pedal and damper bar was easy. For the speed controller I just made a little plate that went on the underside of the unit and hooked under the note rail. Both of which I forgot to photograph.